Ben Rowe and his father Mike sure pulled a heist job on their competition in New England Pro Stock (Super Late Model) racing this season. Ben was one win shy of his father, but he did him one better in the points. 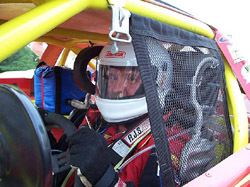 Ben won four times with double victories at New Hampshire’s Canaan Fair Speedway and White Mountain Motorsports Park. That was more than sufficient for the 2005 PASS championship. Neither driver took the easy way to get there though. “We had this as our goal at the beginning of the year and it’s been a long year,” said Ben Rowe. Ben started out the first race of the season with the flu. He won at the PASS opener at White Mountain but the bigger accomplishment was just finishing the 150-lap race. Upon exiting the car, he was a little green around the gills. In the next two races, he accumulated a third at Thompson Speedway (CT) and his first of two Canaan wins. But then the wheels started to come off his wagon, at least by Ben Rowe standards. The 2002 and 2003 PASS champion isn’t used to struggling. For nearly two months, that’s what he was doing. 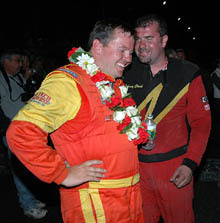 Attrition helped him notch back-to-back third-place finishes at Riverside Speedway (NH) and Oxford in early June, but the rest of Rowe’s early summer wasn’t very much fun. The #00 team could not quite get the handle on their new racecar. At this point, did Ben think that a championship was in the cards? Things got so bad that Ben and his team even borrowed their old racecar back from its new owner, Oxford regular Chris Kennison, to tow to White Mountain in July. They won. After a more lesions learned with their new car, they started to become a force with the new car as well. After his second win at White Mountain, Ben Rowe didn’t finish out of the top 10 in any PASS races. He only finished two of them outside of the top five and that includes the Star season finale where he spun out of second place with less than 10 laps left on the board. While Ben started out the season struggling with speed, but managing to still rack up consistent finishes, Mike Rowe had the opposite problem. Father Mike led the way when it came to race victories. 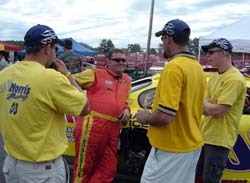 He won the TD Banknorth 250 at Oxford Plains Speedway (ME) and five IBG-PASS races, including the tour’s biggest races on both sides of the American/Canadian border. The elder Rowe won the Pullen Heavy Industries 300 at Beech Ridge and the Atlantic Cat 250 at Scotia Speedworld. He also scored other victories at Unity Raceway (ME), Speedway 95 (ME) and a second race at Scotia. This Rowe finished second in the point standings. Mike probably had the fastest car of anyone at the beginning of the season [actually, all through the season], but encountered a variety of problems. At White Mountain, he tangled with a lapped car while leading. 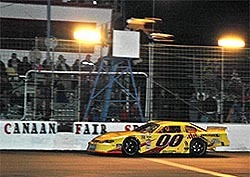 At Thompson, he wrecked two cars for reasons out of his control over the course of the weekend, at Oxford, he had electrical problems and at Riverside he got into a controversial incident with a lapped car and then leader Travis Benjamin, which cost him a chance at the victory. In the Unity 250, he lost another shot at the win as he went from the lead to spinning with Johnny Clark on the final lap due to some hard racing. In the middle of all those things, Mike Rowe won at Scotia in late June. That helped turn the tide. From then through September Mike Rowe won every other race on the schedule. Still, the early season bad luck came back to bite him. When the season ended, Mike Rowe was 20 points behind his son in the title fight. All told, the Rowes teamed up to win exactly half of the 18 PASS point races this season – and they had fun doing it. “I love it,” said Ben. “It’s great racing him. We kind of watch out for each other. I let him in sometimes and he lets me in. There’s no shortage of mutual respect either. Father and son also work side-by-side hauling and excavating during the week at Rowe and Sons Trucking. That makes for some good and bad days after the race dust ahs settled. Racing does come up more than occasionally at the workplace. Sometimes they talk about what makes them go fast, but as competitors they don’t give away too much information. Mike must have given Ben just enough information this season to get beat by his son. But when it was all said and done, both Rowes won. Just like when he watched Ben beat him to win the TD Banknorth 250 at Oxford in 2003 and 2004, Mike had plenty of quiet fatherly pride while watching Ben be crowned the 2005 PASS champion. You also get the impression in talking to Mike Rowe that fatherly pride only goes so far and that he fully intends not to come up a little short next season.